In 2014, three young children were removed from their Ohio home after suffering unspeakable acts of abuse. The kids were so traumatized, it took them months to even begin to open up to investigators about what had happened to them. When it came time to go to court, two of them had to testify from a separate room because facing their attackers was just too traumatic. Sadly, this is all too common. Research focusing on sexual abuse shows that testifying in court can actually amplify trauma for young victims, yet so many are forced to take the stand regardless. This is a huge problem. The Sixth Amendment to the Constitution gives defendants the right to confront their accusers in court. And it’s a really, really tough thing to reconcile. In America, you’re innocent until proven guilty, and you deserve a fair shake in court. But at what cost? How can we make sure our trials are fair and justice is served without putting victims through such an awful emotional ordeal? Ellen O’Neill Stephens and Celeste Walsen think they have the answer: dogs in the courtroom to comfort witnesses. 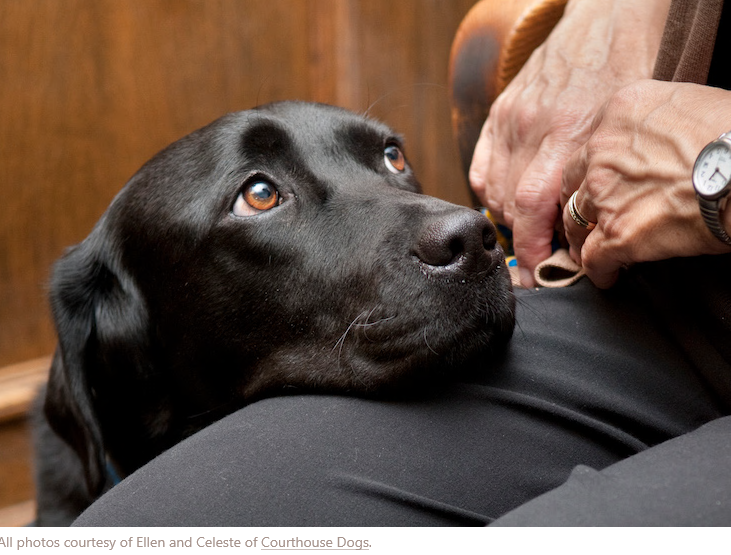 Ellen, a retired prosecutor, and Celeste, a veterinary doctor, run Courthouse Dogs, an organization that advocates for more dogs in the criminal justice process. And not just in the courtroom, either, but also in child advocacy centers and during prosecutor interviews as well. If you ask me, more dogs is always a good thing — no matter the situation. But Ellen and Celeste actually have some excellent evidence behind why we need them in court. The dogs provide a calming presence, whether they’re curled up on the couch with a child as he or she gets interviewed by a prosecutor or sleeping peacefully at the feet of a witness in the witness box. Celeste says that because of the longstanding relationship between humans and dogs, “we count on dogs to tell us when there’s a bad guy around.” So when we’re in the presence of a relaxed dog, it makes us feel that we’re in a safe place, which can lower our blood pressure and reduce anxiety. These are no ordinary dogs. They undergo years of training, and only the best of the best ever make it to the big show. Unlike therapy dogs, who are regular dogs who have completed some basic coursework, courtroom facility dogs are raised for this kind of work from the get-go. Trainers start by introducing teeny, tiny bits of stress to the young dogs — like putting them on a cold metal surface — and then picking them up and soothing them with cuddles. By the time they’re grown, the dogs are practically immune to chaos and high-stress situations. It takes about two years of this kind of training before the dogs are deployed to a prosecutor’s office or other justice outfit, where they then work full-time defusing tense environments and putting witnesses at ease. Right now, according to Ellen and Celeste, there are about 87 dogs working in some capacity in 28 states, mostly Labradors or golden retrievers, since they look so dang friendly and have calm temperaments. But the program is starting to gain worldwide traction, with dogs now in places like Chile and Canada. 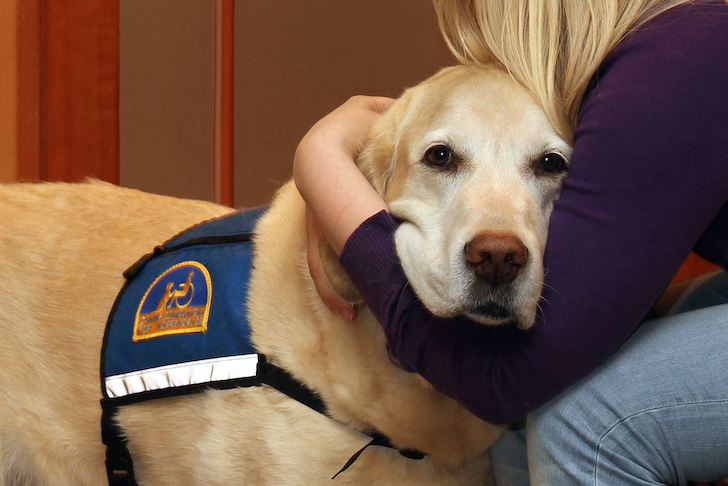 Courtroom dogs can make victims feel safe, but the real purpose of the program is to help us get to the truth. Ellen and Celeste told us their vision is to one day see these dogs available to anyone who’s been traumatized by crime, old or young, male or female, innocent … or even guilty. They told me that young victims will often shut down during interviews, especially because their parents often can’t be there. Bring in a dog, though, and they’ll start to pet it and often slowly start to relax and start talking. Courthouse Dogs wants to have canines in interview rooms and courthouses all over the world so people, even defendants, feel comfortable enough to tell their version of the story. At a minimum I think that anyone under 16 in that situation should be excused or at least reduce that confrontation by doing a video link or just voice. The fear of actually being near their attacker would close anyone down, let alone a child. But I agree that using the dogs to calm those very situations is the least that can be done. Maybe it should be law that if the accused forces a confrontation but is still found guilty, they should suffer added years for forcing the confrontation, hoping that in creating fear in the child (or other), they will not testify properly or recant what accusations have been leveled at them. The accused might rethink that strategy then and reduce that process of making the children (or others), to suffer the trauma of those confrontations. And that law wouldn’t affect anyone that had been falsely accused, because that means in truth, the child (or other) ‘knows’ that it isn’t that person, so it wouldn’t be stressful for them. So the accused can freely ask what is needed to clear the accusation against them. This law would only make ‘guilty’ people think twice on that course of action. Great post Theresa, I am glad that there are people always looking into these situations to make it easier for the victims of these horrendous acts. What a fantastic idea. When the hurt and the broken can be offered comfort to this degree they can have their confidence rebuilt. The world isn’t their enemy.